a. Or "Federation of Saint Kitts and Nevis". The Federation of Saint Christopher and Nevis (; also known as the Federation of Saint Kitts and Nevis), located in the Leeward Islands, is a federal two-island country in the West Indies. It is the smallest sovereign state in the Americas, in both area and population. 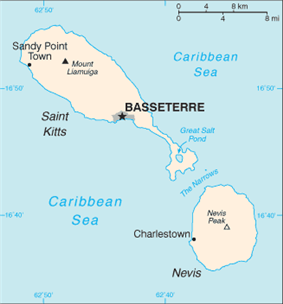 The capital city and headquarters of government for the federated state is Basseterre on the larger island of Saint Kitts. The smaller island of Nevis lies about 2 miles (3 km) southeast of Saint Kitts, across a shallow channel called "The Narrows." Historically, the British dependency of Anguilla was also a part of this union, which was then known collectively as Saint Christopher-Nevis-Anguilla. Saint Kitts and Nevis are considered to be geographically part of the Leeward Islands. To the north-northwest lie the islands of Sint Eustatius, Saba (the Netherlands), Saint Barthélemy, Saint-Martin/Sint Maarten and Anguilla. To the east and northeast are Antigua and Barbuda, and to the southeast is the small uninhabited island of Redonda, and the island of Montserrat, which currently has an active volcano (see Soufrière Hills). Saint Kitts and Nevis were among the first islands in the Caribbean to be settled by Europeans. Saint Kitts was home to the first English and French colonies in the Caribbean, and thus has also been titled "The Mother Colony of the West Indies." Saint Kitts was named "Liamuiga" by the Kalinago Indians who inhabited the island. This name, roughly translated, in English means "fertile land," a testimony to the island's rich volcanic soil and high productivity. Nevis' pre-Columbian name was "Oualie," which translates to "land of beautiful waters," presumably referring to the island's many freshwater springs and hot volcanic springs. Christopher Columbus, upon sighting what we now call Nevis in 1493, gave that island the name San Martin (Saint Martin). However, the confusion of numerous, poorly charted small islands in the Leeward Island chain, meant that the name ended up being accidentally transferred to another island, the one which we now know as the French/Dutch island Saint-Martin/Sint Maarten. The current name "Nevis" is derived from a Spanish name Nuestra Señora de las Nieves (The original name was the archaic Spanish "Noestra Siñora delas Neves"), by a process of abbreviation and anglicisation. This Spanish name means Our Lady of the Snows. It is not known who chose this name for the island, but it is a reference to the story of a fourth-century Catholic miracle: a snowfall on the Esquiline Hill in Rome. Presumably the white clouds which usually wreathe the top of Nevis Peak reminded someone of the story of a miraculous snowfall in a hot climate. The island of Nevis, upon first British settlement, was referred to as "Dulcina," a name meaning "sweet one." Its original Spanish name, "Nuestra Señora de las Nieves," was eventually kept however, though it was soon shortened to "Nevis." There is some disagreement over the name which Columbus gave to St. Kitts. For many years it was thought that he named the island San Cristobal, after his patron saint Saint Christopher, the saint of travelling. However, new studies suggest that Columbus named the island Sant Yago (Saint James). The name "San Cristobal" was apparently given by Columbus to the island now known as Saba, 20 miles northwest. It seems that "San Cristobal" came to be applied to the island of St. Kitts only as the result of a mapping error. No matter the origin of the name, the island was well documented as "San Cristobal" by the 17th century. The first English colonists kept the English translation of this name, and dubbed it "St. Christopher's Island." In the 17th century, a common nickname for Christopher was Kit, or Kitt. This is why the island was often informally referred to as "Saint Kitt's Island," further shortened to "Saint Kitts." Today, the Constitution refers to the state as both "Saint Kitts and Nevis" and "Saint Christopher and Nevis," but the former is the one most commonly used. The Spanish capture of Saint Kitts by Don Fadrique de Toledo in 1629. Five thousand years prior to European arrival, the island was settled by Native Americans. The last wave of Native American arrivals, the Kalinago people, arrived approximately three centuries before the Europeans. The islands were discovered by the Europeans through a Spanish expedition under Columbus in 1493. In 1538, French Huguenots established a settlement on St. Kitts but the settlement was destroyed by the Spanish soon afterwards and the survivors were deported. In 1623, an English settlement was established, which was soon followed by French settlements, the island being divided by agreement. 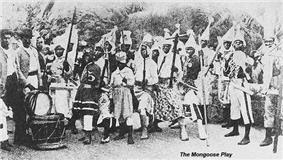 Dissimilar to many other islands, the local Kalinago people on the island allowed Europeans to colonise Saint Kitts. In 1626, the Anglo-French settlers massacred the Kalinago in a brutal way. 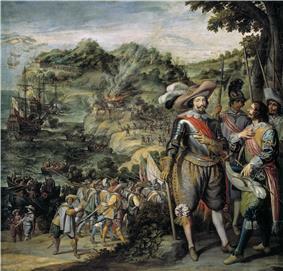 A Spanish expedition, sent to enforce Spanish claims, destroyed the English and French colonies and deported the settlers back to their respective countries in 1629. As part of the war settlement in 1630, the Spanish permitted the re-establishment of the English and French colonies. As Spanish power went into decline, Saint Kitts became the premier base for English and French expansion into the Caribbean, as the islands of Antigua, Montserrat, Anguilla and Tortola for the English, and Martinique, the Guadeloupe archipelago and St. Barts for the French were colonised from it. During the late 17th century, France and England battled for control over St Kitts. It was ceded to Britain in 1713. Saint Kitts and Nevis, along with Anguilla, became an Hurricane Georges caused approximately $458,000,000 in damages and property and limited GDP growth for the year and beyond. Georges was the worst hurricane to hit the region in the century. Saint Kitts and Nevis is a sovereign, democratic and federal state. The Queen of Saint Christopher and Nevis, Elizabeth II, is its head of state. The Queen is represented in the country by a Governor-General, who acts on the advice of the Prime Minister and the Cabinet. The Prime Minister is the leader of the majority party of the House, and the cabinet conducts affairs of state. The country may also be described by the unofficial term, "Commonwealth realm", because it is a constitutional monarchy which shares the same monarch as some other members of the Commonwealth of Nations. Saint Kitts and Nevis is a full and participating member of the Organisation of Eastern Caribbean States (OECS). The country consists of two main islands, Saint Kitts and Nevis. The highest peak, at 1,156 metres, is Mount Liamuiga on St. Kitts. Saint Kitts and Nevis is a twin-island federation whose economy is characterised by its dominant tourism, agriculture and light manufacturing industries. Sugar was the primary export from the 1940s on, but rising production costs, low world market prices, and the government's efforts to reduce dependence on it have led to a growing diversification of the agricultural sector. In 2005, the government decided to close down the state-owned sugar company, which had experienced losses and was a significant contributor to the fiscal deficit. Former sugar plantations still dominate the St. Kitts landscape; however, many of the cane fields are being burned to make room for land development, especially on the northern side of the island, in the parishes of Saint John Capisterre and Christchurch. The agricultural, tourism, export-oriented manufacturing, and offshore-banking sectors are being developed and are now taking larger roles in the country's economy. The growth of the tourism sector has become the main foreign exchange earner for Saint Kitts and Nevis. The country has also developed a successful apparel assembly industry and one of the largest electronics assembly industries in the Caribbean. St. Kitts is dependent on tourism to drive its economy. Tourism to the island has been expanding since 1978. 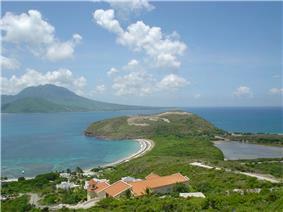 In 2009 there were 587,479 arrivals to Saint Kitts compared to 379,473 in 2007. This growth represents an increase of just under 40% in a two-year period. As tourism grows the demand for vacation property increases in conjunction. In hopes of expanding tourism, the country hosts its annual St. Kitts Music Festival. St Kitts & Nevis also acquires foreign direct investment from their citizenship by investment program, outlined in their Citizenship Act of 1984. Interested parties can acquire citizenship if they pass the government's background checks and make an investment into an approved real estate development. St. Kitts allows foreigners to obtain the status of St. Kitts citizen by means of a government sponsored investment programme called Citizenship-by-Investment. Established in 1984, St. Kitts’ citizenship program is the oldest prevailing economic citizenship program of this kind in the world. St. Kitts’ Citizenship-by-Investment program offers multiple benefits. According to their official website: "When you acquire citizenship under the St. Kitts & Nevis citizenship program, you and your family enjoy full citizenship for life, which can be passed on to future generations by descent. As citizens of St. Kitts & Nevis, you and your family are issued with passports which allow visa-free travel to more than 120 countries and territories worldwide, including all of the EU. Of course you have the right to take up residence in St. Kitts & Nevis as well as in most of the CARICOM member countries at any time and for any length of time". Each candidate must go through several legal steps and make a qualifying investment into the country  and should complete certain legal requirements to qualify for citizenship under the investment programme. There is a minimum investment that has to be made by the applicant, in either an approved real estate or in the Sugar Industry Diversification Foundation (a public charity), to qualify for the economic citizenship of St. Kitts & Nevis. The primary way to qualify for the program is through the purchase of government approved real-estate to the value of US$400,000 and, with the help of the program, Saint Kitts and Nevis is on its way to becoming one of the Caribbean’s most luxurious and popular destinations. Compared to other Caribbean islands, overall real estate prices in Saint Kitts and Nevis remain low and provide substantial room for capital appreciation. Reports conducted by Henley Estates, the leading real estate company servicing the clients seeking qualifying citizenship investments, shown that over the three years to 2012, depending on the project, apartment values have gained from 5% - 9% per annum, and select pre-construction resort investments were 7% - 12% per annum during the same time period. These figures are based on 238 transactions during this period. Henley Estates is the only firm to conduct an annual survey on the St. Kitts and Nevis property market values and monitor the property market appreciation. There are eight publicly administered high/secondary level schools in St Kitts-Nevis, and several private secondary schools. St Theresa's Convent School and St. Joseph's School, which merged in 2010 to form the Immaculate Conception Catholic School (ICCS) – Kindergarten to Grade 11 (or 5th form) – the traditional Caribbean final secondary school grade. St Kitts and Nevis counts a cancer center considered as a referral center for the Eastern Caribbean located in Mount St. John Hospital in Antigua. This center provides Caribbean citizens the opportunity to undertake radiotherapy and chemotherapy locally rather than travelling to the United States or United Kingdom. The whole project was managed by Dr. Arthur Porter since the beginning. In July 2000, there were 42,696 inhabitants; their average life expectancy was 72.4 years. Emigration has historically been very high, and high levels of such in the country has resulted in a continuous decrease in the country's population by about 25% since its peak of about 51,100 in 1960. Cricket is common in Saint Kitts and Nevis. Top players are contributed to the West Indies cricket team. 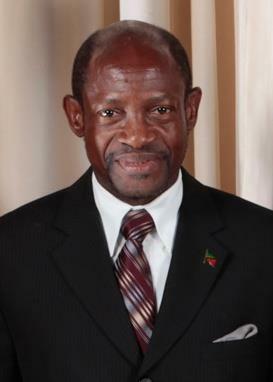 The late Runako Morton was from Nevis. Saint Kitts and Nevis is the smallest country on Earth to ever host a World Cup event; it was one of the host venues of the 2007 Cricket World Cup. The St. Kitts and Nevis national football team, also known as the "Sugar Boyz", has experienced some international success in recent years, progressing to the semifinal round of qualification for the 2006 FIFA World Cup in the CONCACAF region. Led by Glence Glasgow, they defeated the US Virgin Islands and Barbados before they were outmatched by Mexico, Saint Vincent and the Grenadines, and Trinidad and Tobago. ^ a b Data. "GDP per capita, PPP (current international $) | Data | Table". Data.worldbank.org. Retrieved 2014-07-08. ^ "Saint Christopher and Nevis". International Monetary Fund. Retrieved 21 April 2012. ^ Data. "GDP (current US$) | Data | Table". Data.worldbank.org. Retrieved 2014-07-08. ^ "Saint Christopher & Nevis Citizen by Investment Regulations". Retrieved 5 November 2013. ^ "Saint Christopher & Nevis Citizen by Investment Regulations". Retrieved 17 June 2013. ^ "Henley Estates Saint Kitts and Nevis Citizenship Overview and Downloadable Report". Retrieved 29 April 2014. ^ a b "Cancer Treatment Center In The Works For St. Kitts And Nevis". http://www.kittivisianlife.com/. 7 August 2011. ^ "Work resumes on Eastern Caribbean cancer centre in Antigua". http://www.caribbeannewsnow.com/. 5 March 2013. ^ "Don't Forget Arthur Porter". http://www.thestkittsnevisobserver.com/. 29 November 2013. ^ "No proof Dr. Arthur Porter was acting as Sierra Leone diplomat when arrested in Panama, says envoy to Canada". http://www.thestar.com/. 4 June 2013. ^ "In St. Kitts, passport 'sales' lead to escalating political drama". https://groups.google.com. 9 June 2014. ^ Ben Cahoon (2000). "Saint Kitts and Nevis".